Hear the late, great jazz legend perform in 1974. 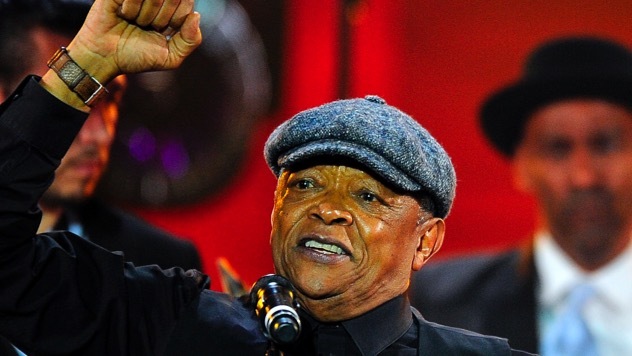 Hugh Masekela, the legendary South African musician and activist, has died, the New York Times reports. He was 78. Masekela, a pioneer of South African jazz, released 40 solo albums and collaborated with such artists as Harry Belafonte and Paul Simon. He was also known for his anti-apartheid activism, releasing the song “Mandela (Bring Him Back Home),” about Nelson Mandela, in 1987. Paste is lucky to have exclusive access to some rare and incredible Hugh Masekela recordings. Check them out below, and read on to celebrate the life of this extraordinary musician. Born and raised in the oppression of South African apartheid, by the mid-1950s, Hugh Masekela became one of the most in-demand young musicians in all of South Africa, working with pianist Abdullah Ibrahim and his own future musical partner and spouse, singer Miriam Makeba. Wielding his trumpet like a weapon, he soon developed into a raw and powerful player, inspired by African-American artists like Miles Davis and Paul Robeson. While enrolled at the prestigious Manhattan School of Music in the 1960s, he was exposed to the American jazz scene and the culture of New York City opened up a world of new possibilities. As the intense cultural changes of the ‘60s unfolded, Masekela’s music also began to change, incorporating contemporary musical elements into the mix. Along with a whole new wave of rock bands, Masekela was ushered into the American consciousness by his appearance at the 1967 Monterey Pop Festival, where he truly emerged, along with artists like Jimi Hendrix and Janis Joplin. The following year, he hit it big with “Grazing In The Grass,” which shot up to #1 on both the pop and R&B charts. After riding a wave of popular success through the late-1960s, Masekela returned to his homeland in 1970, joining Miriam Makeba for a tour of Guinea. It was during this tour that he first met the Nigerian AfroBeat musician, Fela Kuti, and the Ghanian band, Hedzoleh Soundz, who were blazing through Africa with a new form of jazz-funk that was heavily influenced by the interlocking rhythms of AfroBeat and the thick grooves of James Brown. In 1973, they made the breakthrough album, Introducing Hedzoleh Soundz. Even decades later, this album remains one of the most compelling examples of a jazz musician working within an authentic form of African music. It is rightly considered one of the greatest and most influential African-Jazz fusion albums of all time. Which brings us to 1974, when Masekela and Hedzoleh Soundz brought their highly original music to American audiences for the first time. Thankfully, these rare recordings from Masekela’s Record Plant performance capture this historical moment in crystal clarity. One of the finest examples here is “Languta,” a standout track from the above-mentioned album. Every second of this performance cooks with volatile tribal rhythms and thick sumptuous bass and guitar work. Add to this Masekela’s blistering trumpet runs and the belted out African vocals, and a swirling wave of sound engulfs the listener into a world awash with emotion.